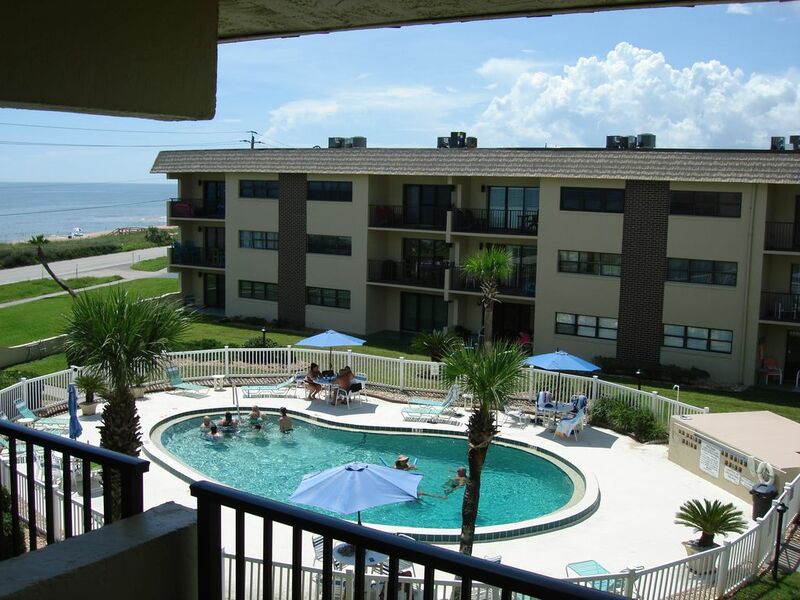 Flip Flops is a fully furnished and fully equipped two bedroom, two bath condo with a private deeded beach and beautiful ocean views from every window! Decorated with a feel of Ormond Beach with tile and wood laminate floors throughout living space. Spacious master bedroom with king bed, two closets and plenty of drawer space. The second bedroom has a queen bed, spacious closet and dresser; in addition there is a twin mattress that can be used on the floor for a small child.The living room and bedrooms have TV's for your viewing pleasure. Master bathroom has a walk-in shower and the second bath a regular tub with shower,. Kitchen is fully equipped with a glass stove top/oven, large refrigerator, dishwasher and microwave. Laundry facilities are located on the same floor. The unit is located on the third floor, so you don't have to worry about noisy neighbors. Flip Flops is equipped with all the essentials you will need to go to the beach, (beach cart, cooler, beach chairs & towels). Our private beach is just across route A1A and is just a short walk away. toilet, shower, Walk in shower, bath towels & hair dryer included. toilet, tub, shower, Bath towels & hair dryer included. Both bathrooms include bath towels, hair dryers, toilet paper, tissues & soap. Additional linens are stored in the closets. Located close by next to elevator outside of unit. Wifi is available and included. Bath and beach towels are included. Large living room with plenty of seating and a very large television. Standard dishwasher with detergent provided. Large refrigerator with double doors. Water and ice are available from the exterior of the refrigerator door. Glass stove top with five burners. Plates, silverware, glasses, cooking utensils are provided. Plastic cups are also available for taking to the beach. This is a private beach so please dispose of properly. Fully equipped kitchen includes all new appliances in 2019. Refrigerator, oven / stove, microwave, toaster, dishwasher, Kuerig coffee maker, pots, pans, silverware, glassware and storage containers. Four person dining room table with a leaf in the closet making it capable of seating six people. Large 60" living room television. Each bedroom also a TV. Games, books & playing cards. Spacious balcony with a great view of the Atlantic Ocean. Dolphin sightings are a common occurrence! Non-heated pool 3 to 8 feet deep.